DALLAS, TX--(Marketwired - Jun 24, 2015) - Pizza Patrón today announced that it has completely reworked its website www.pizzapatron.com to be faster, easier and mobile-optimized. The new design adapts to any device, from desktop to tablet to mobile, to improve the customer experience regardless of the size of the user's display or capabilities of the equipment being used. 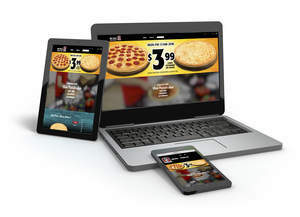 At a time when smartphones vastly outsell personal computers, Pizza Patrón discovered that nearly 70% of its website visitors were browsing on a mobile device. The new, responsive web design also allows for easy adaptation to different devices and any browser upgrades in the future. "By focusing on the content that matters most to our customers like 'What's on the menu?' and 'Where can I get it?' and enhancing the site for mobile use, we can deliver a top-notch experience to guests," said Andrew Gamm, executive vice president for Pizza Patrón. "Local SEO, content and architecture has also been enhanced and the website has improved keywords for search engines like Google, Bing and Yahoo." Verifying and correcting the accuracy of store information online was also a critical component of the update as the new site utilizes the device's GPS to identify restaurants in the vicinity, making finding a location near you easier than ever. "We completely reversed the focus of our site from franchise sales to food sales and made it 100% consumer facing," said Gamm. "We also improved the food photography, menu navigation and included nutritional information for all of our products." To view the new website, visit www.pizzapatron.com.